If you would like to know which are our listed 6 Best Home Coffee Grinders, read on for the right option. Don’t Take Grinding for Granted! Ground coffee wears off faster than roasted grains. The first option has more surface exposure to air and loses flavor and aroma faster. A great lot of drinkers prefer to grind their beans right before the brewing process. Krups duty is to bring the perfect cup of coffee. That includes recently ground beans. This device is our number one choice for professional Home Coffee Grinders. If you are serious about grinding coffee at home or office, consider our second choice. This grinder is terrific for both drip and espresso brewing. 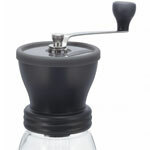 An easy-to-use home coffee grinder this one is small, lightweight, and portable. The perfect idea for indoors and outdoors brewing with a rustic style. This one is a modern version of a grinder we had here at my family’s farm when we used to grind our Brazilian coffee on “manpower”. :)P Our device was mounted on a wooden box and had a little drawer from which you could gain access to the ground coffee. Don’t take grinding for granted! Like all kitchen activities, coffee making is an art and grinding is a very enjoyable part of that artistic expression. If you have any suggestions about home coffees and/or equipment, please feel free to place your idea, and I’ll take a look at it for a possible inclusion. Please leave a comment about this 6 Best Home Coffee Grinders article. Your opinion is very important to us. Thanks for your time. 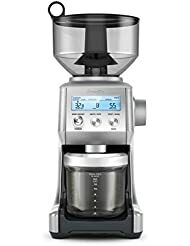 Wow, I really like the KRUPS F203 Electric Spice and Coffee Grinder the best and the price is right too! I did click on the link and it brought me to the Amazon site and I did some reading on it. Problem is that I only have a Keurig. Can you use ground coffee with a Keurig? I would be curious to know. Did away with my regular coffee pot so we wouldn’t drink so much coffee! Great to see you again! Thanks for leaving your impressions. You can grind your coffee in the Krups F203 and use it to make coffee on the Keurig as you can see here on the article Brazilian Keurig Coffee Options . I am a huge coffee drinker and find coffee to be very important to me! I love that the best grinder is not the most expensive. It is so easy to get caught up in buying something because it is a certain high end brand. Clearly as your review shows, that is not always the best option. Thank you for your insight. The last time I went to buy a coffee grinder I was really confused by all the different products available. This is a great guide for giving me a place to start my research. Out of curiosity though, what exactly is it that the Krups machine does so well that makes you give it the highest rating against other more expensive models? Basically: The inner oval shape of the chamber, the rotation speed and the price. If you want to know more details about it, check this article, Krups F203 Electric Coffee Grinder Review. Thanks so much for your words and impressions. Cheers! Great post, I love how you’ve laid it out, really nice and easy to follow. I would love to get me one of these. Coffee is so much better when it’s ground up at home, no idea why, but this is definitely the case. It seems more fresh and more natural and also you can make it exactly how you like it. Love your site by the way. Keep up the good work! You instinct about it is right. Thanks for your kind words, Cheers! just one question, what was your main reason behind giving the Krups machine your highest rating compared to other top of the range products? Thanks. If you need more elaborate information on that grinder, please reach this review, Krups F203 Electric Coffee Grinder Review. Rating merchandise is always a tricky business. We have a formula here and give it to more than 2 people to fill its variables in form. One of the many variables is two famous online sellers rating average. One other is average price. The latter pulled this grinder from second to first place. Thanks for sharing your impressions. Cheers! I’m a huge coffee fan and make bullet-proof coffee to keep me going through the day. I grind my coffee fresh daily. It just makes a difference in the taste of coffee. And it smells wonderful. I actually own the Krups coffee grinder and highly recommend it to anyone. It is super easy to use and quick. Thanks for sharing your experience. Cheers!